Jeff Atwater, left, fishes with his daughter Hannah Atwater, 6, right, during a Father's Day Fishing event held at Silverbell Lake at Columbus Park on June 19, 2010 in Tucson, Ariz.
Rose Canyon Lake is a good place to take the family during the hot summer months. Natalia Smith, 10, dips her net for minnows while mom Stacey collects water in a bucket as the family settles in for an afternoon of fishing for catfish at Lakeside Park. Victor, who declined to provide his last name, guides daughter Mary while playing a practice fishing game during a fishing clinic at Silverbell Lake at Christopher Columbus Park. Ducks and fishermen enjoy the lake at Kennedy Park in this 2009 file photo. There hasn't been much done at the park in terms of maintaining or improving existing park features in the past 20 years. The boat ramp at Peña Blanca Lake, which was created in 1957 by the state game and fish department, makes it easier for boats to enter and exit the lake. It is located northwest of Nogales, Ariz., on March 21, 2017. Mercury contamination, possibly from the old mines in the area, necessitated its closure and dredging in the past. It has been reopened and is stocked with Rainbow Trout but it also has Channel Catfish and Largemouth Bass. Fishing at Patagonia Lake created fun memories for this father and son. 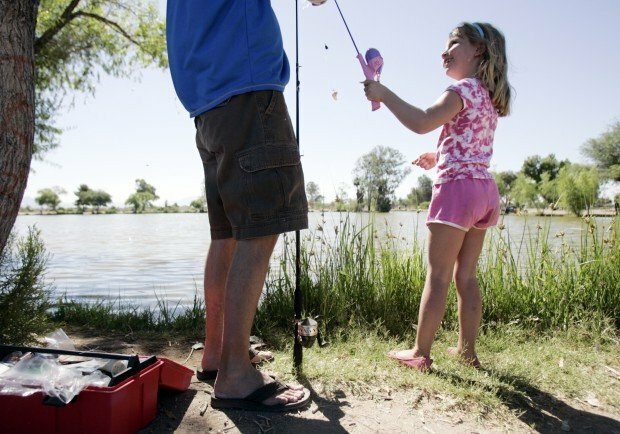 You can take the family fishing for free at all Arizona lakes Saturday, June 2. That means you don't need a license to fish. Kids under 10 are always free, but if you don't want to invest in licenses for the adults or older children in the family, this is a good way to test the waters, so to speak. And, you don't have to drive 478 miles. There are urban lakes IN Tucson, as well as fishing holes less than two hours away. This urban lake is located in Chuck Ford Lakeside Park, 8201 E. Stella Road, on the southeast side of town. Non-motorized boats are allowed. The lake's maximum depth is 35 feet and is stocked with catfish, trout, bass and sunfish. The park features playgrounds, sports fields and a walking trail. Located at Christopher Columbus Park, 4600 N. Silverbell Road, this 13-acre lake allows non-motorized boats and is stocked with catfish, trout, bass, sunfish and white amur. The lake is 7 feet at its deepest point. The park features large shade trees, ramadas, a playground, dog park, model airplane area and another lake for model boats. This 10-acre lake is located in J.F. 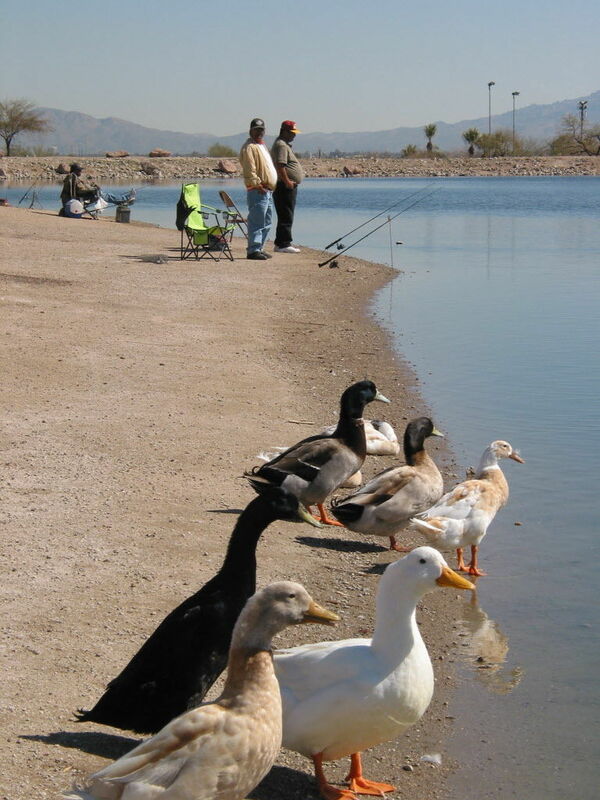 Kennedy Park, 3600 S. La Cholla Blvd., Non-motorized boats are allowed and the lake is stocked with catfish, trout, bass, sunfish and white amur. Its maximum depth is 12 feet. Kennedy Park features ramadas, a playground, sports fields and a swimming pool. Sahuarita Lake Park is located at 15466 S. Rancho Sahuarita Road. The 10-acre lake is 12 feet at its deepest point and is stocked with catfish, trout bass and sunfish. Boating in non-motorized boats is allowed between sunrise and sunset. The park features an outdoor amphitheater, ramadas and a walking trail. Although it's not right in the heart of Tucson, you can get to Rose Canyon Lake in about 30 minutes. It's located about 17 miles northeast of Tucson off of Catalina Highway on Mount Lemmon. That means it's cooler. So, if you're looking for a place to sit by the water and/or catch some fish, this is a good option. Swimming and boating are not allowed on this lake. There is a 1-mile trail around the lake, picnic areas and wildlife viewing opportunities. Click here for directions from downtown. About an hour and 20 minutes southeast of here, you'll find Patagonia Lake. It's a gorgeous drive, winding through Elgin and Sonoita. You can fish, boat, camp and swim at this 265-acre lake. You can catch large mouth bass, flathead catfish, crappie, bluegill, red ear and green ear sunfish. 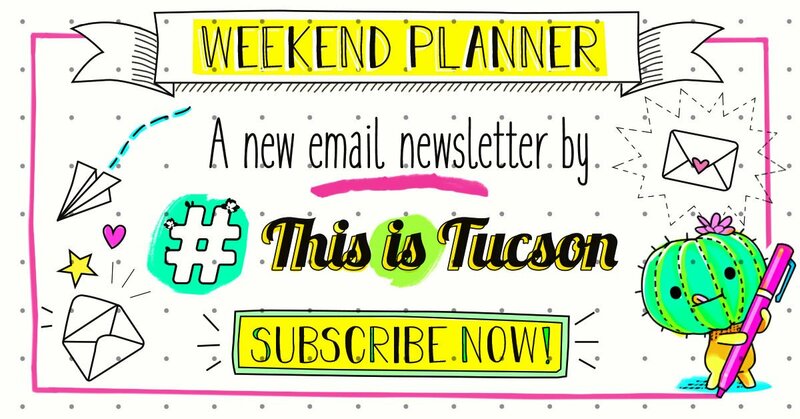 Click here for directions from Tucson. About 68 miles south of Tucson, you'll find Pena Blanca Lake. It's a good sized body of water filling 49 acres of Pena Blanca Canyon. You can boat, fish and swim in this lake. Boats are limited to one 8-horse power motor or less. You can catch rainbow trout, large mouth bass, crappie, sunfish and channel catfish here. It's a little cooler here than in Tucson since the elevation is 4,000 feet making it a nice respite from the summer heat. Beer, food, prizes and hair styling. Who doesn't need a kid-free date night? Summer survival sometimes means embracing nocturnal living. At least a little bit. Grab your bff and head over to Fourth Avenue this weekend for fun, food, shopping and maybe even a beverage ... or three.